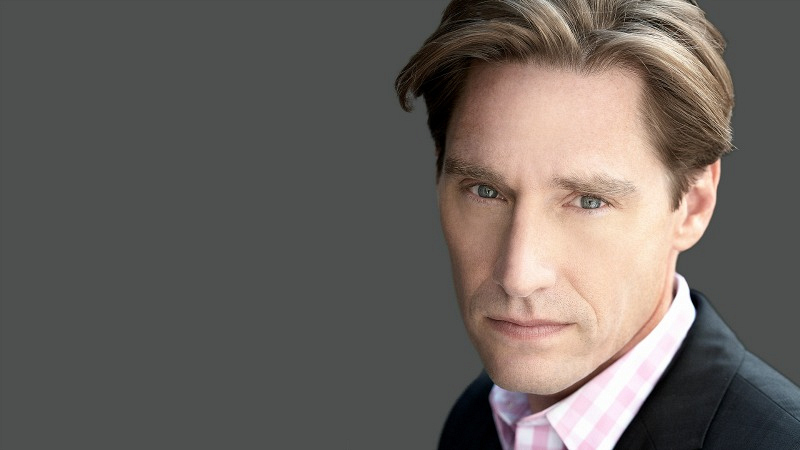 Find out how Dan Lawson and Christine Baranski picked these beautiful pieces with a trip back through the fashion-forward litigator's wardrobe. 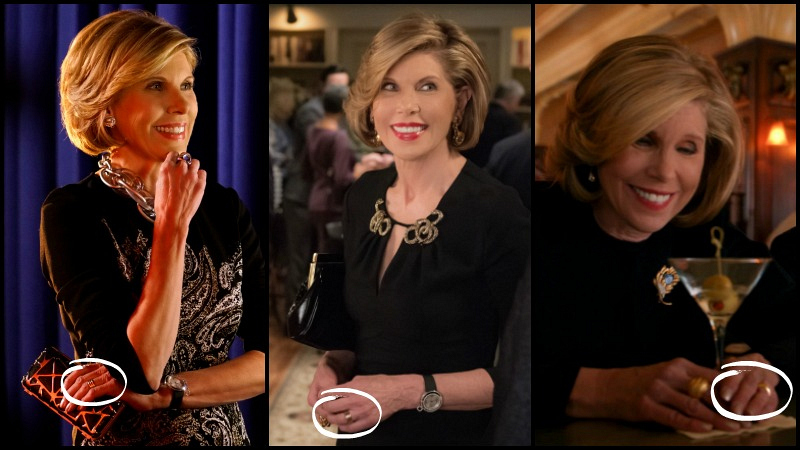 Eagle-eyed Good Wife fans have surely noticed the resurgence of some of Diane Lockhart's trendy jewelry pieces. 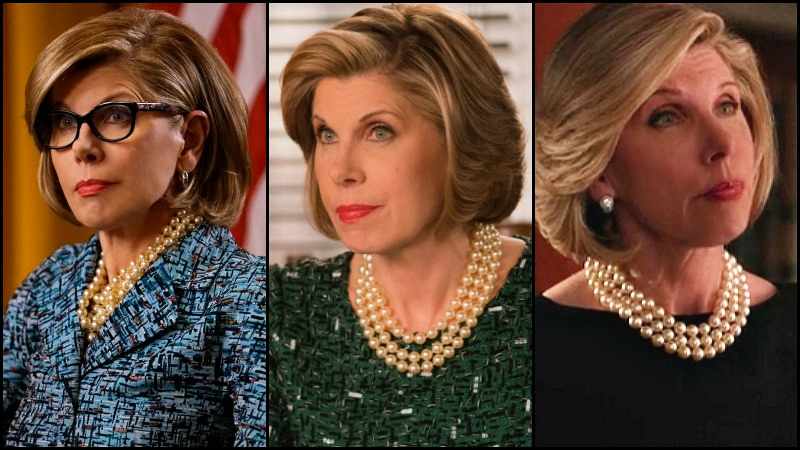 Dan Lawson, the brilliant costumer responsible for The Good Fight's amazing fashion (as well as all seven seasons of The Good Wife's looks), shares how he and Christine Baranski chose Diane's signature baubles—and shares the personal stories behind them. Where you've seen these before (from left): "Dear God" (Season 6, Episode 3 of The Good Wife), "A Precious Commodity" (Episode 3, Season 5 of The Good Wife), and "Stoppable: Requiem For An Airdate" (Episode 5, Season 1 of The Good Fight). The story behind Diane's dragonfly brooch: "When Christine and I first started talking about Diane's look, we always discussed Diane having vintage pieces that she either bought or were handed down to her. I always thought that Diane would wear a pin from time to time because it is a classic style and can really add elegance and purpose to a look. This dragonfly brooch was a piece that I felt had been handed down to her. The diamond in the middle makes it look extra special as well as valuable. I am glad to see that I am consistent with the placement on her jackets. I like that the dragonfly is looking up at Diane, which actually draws the viewer's face to Diane's. This particular brooch came from a little shop near Christine's lake house. It is no longer in business, I'm afraid. Christine and I both thought this brooch was a special piece, worthy of being worn by Diane." With a potential judgeship on the horizon and a mutiny at Lockhart / Gardner, "A Precious Commodity" is a particularly pivotal episode for Diane Lockhart. The beautiful dragonfly brooch appears in a scene where Diane delivers one of her most notorious—and powerful—lines. Stream now. The story behind Diane's earrings: "Thank you, Kenneth Jay Lane for these earrings, too! They are unique and expensive looking – just right for Diane. They are also understated, which doesn’t mean boring. To me, it means they support the outfit as a whole but are characterful and interesting. I love that Diane has a believable and aspirational jewelry collection that she uses. For me it just makes Diane that much more real and supports the story, the character and the wardrobe." 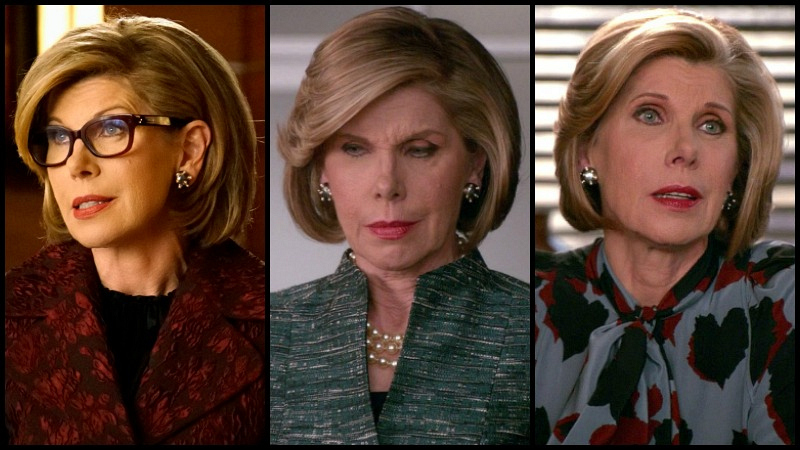 Throughout The Good Wife, Diane's personal mission has always been breaking the glass ceiling. In Season 7's "Unmanned," we see that Diane has not lost her way as she tries to create the first all-female firm in Chicago. However, things go awry when office politics--lead by David Lee--take center stage. Stream now. 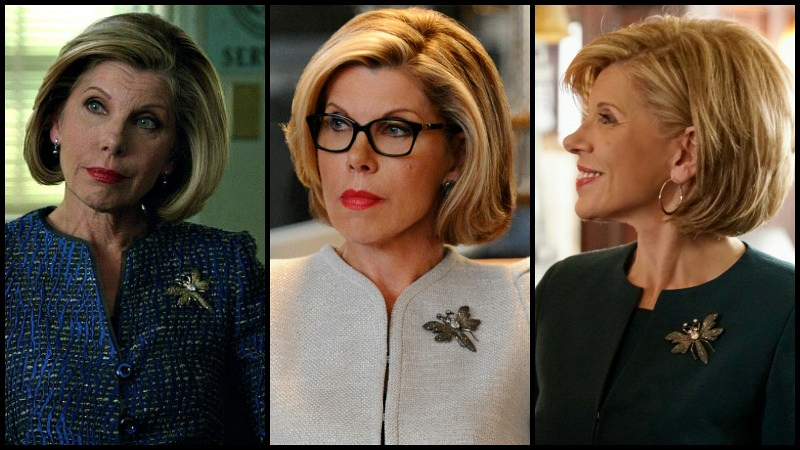 Where you've seen these before (from left): "Not So Grand Jury" (Season 1, Season 7 of The Good Fight), "Monday", (Season 7, Episode 14 of The Good Wife), and "A Material World" (Season 5, Episode 17 of The Good Wife). The story behind Diane's pearls: "Classic and classy! I got this triple strand of pearls from Kenneth Jay Lane years ago, and I thought they would be perfect for Diane - simple and clean, sleek and elegant. I always said that if I were a woman, I would wear pearls. I think they are amazing and the absolute perfect accessory for Diane. They fill in a neckline very well, and I love using them in lieu of a white blouse." "A Material World," is an exceptional example of how, even during a tragedy, Diane triumphs. Plus, the scene when our favorite powerhouse shuts down David Lee's pathetic attempt to leverage her vulnerability to take the firm's reins is not to be missed! Stream now. Where you've seen them before (from left): "Party" (Season 7, Episode 20 of The Good Wife), "The Last Call" (Season 5, Episode 16 of The Good Wife), and "Stoppable: Requiem For An Airdate" (Season 1, Episode 5 of The Good Fight). The story behind Diane's ring: "Again, classic pieces that look real and are believable as something that Diane has invested in and had for years. Also again, these pieces were in my kit. When I had my first fitting with Christine, I had a 12 foot table loaded with jewelry, mostly from my personal stock. We didn't even touch the jewelry at that fitting! Christine came in and saw the jewelry, saw that we had the right things, and I think felt completely at ease knowing we were on the same page and Diane would be well accessorized. It was important to Christine, as well as to me, that Diane be well dressed and be believable as a high powered lawyer. We felt that gold rings were a great way for Diane to have a signature piece that supported an outfit well but didn't steal focus. She started out in the first season of The Good Wife wearing one ring because Christine wanted one signature ring. But after about the third episode, she was onboard with dropping that idea and wearing other rings as well!" While this understated signature ring appears in so many episodes, choosing just one is simply impossible. These back-to-back episodes are essential for both understanding Diane and how her past has shaped her character. Grab some tissues for these episodes—you're going to need them. Stream now. Watch The Good Fight on CBS All Access.